Last week’s Cheese Of The Week (getting a bit tardy with the computer stuff, sorry – but we always have the Cheese of the Week label in the shop if you pop in for a visit, and there is still a bit left) is Blue Cheshire from Bourne’s in Malpas. 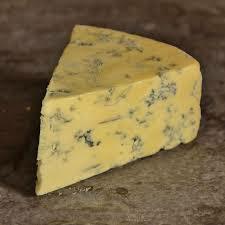 It combines the dry texture and slight sourness of their Cheshire with blue veining. A singular blue cheese to try.